After coming so close to winning at Bristol, #11-Denny Hamlin won his first race of the season with a close victory over #24-Jeff Gordon at Martinsville. With rain threatening on this damp and bitterly-cold day, Hamlin’s decision to pit just before the halfway mark was first viewed as a miscommunication, but when the rain never came, Hamlin found himself with the leaders when it counted. It was a marvelous achievement, for all four Hendrick teams, even the luck-starved #5-Casey Mears, were strong for the entire race and finished in the top 7 spots. With his first checkered flag since New Hampshire last July, another flat track, Hamlin, a native Virginian, also took home one of the track’s famed grandfather clocks for the first time and led 82 laps. 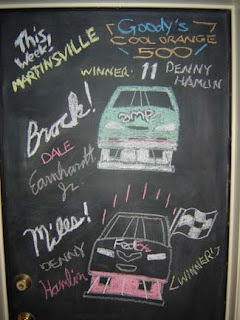 1) #11-Denny Hamlin THE WINNER! 2) #24-Jeff Gordon Scored his 7th Martinsville pole and was very strong early, leading by a full second after just one lap. When pit strategy scrambled the field after the second caution, he was mired in traffic when #43-Labonte spun in front of the field to cause the third caution. Despite the slight damage to his nose in the chain-reaction and falling back to 30th on lap 84, he came back with a vengeance in the closing laps. He lost the handle in the final green flag run following the final caution, then somehow reeled his car back in to close within a second of #11-Hamlin. Led 90 laps. 3) #31-Jeff Burton A collision with #17-Kenseth on pit road creased his right-front fender, but he remained a strong contender in the race. He was infuriated with rookie #00-McDowell, whom he believed cost him a chance at victory by holding him up, but was otherwise pleased with having taken the point lead from #18-Ky. Busch. Led 37 laps. 4) #48-Jimmie Johnson Joined his Hendrick teammates in an assault for the top spot, but, like #24-J. Gordon, faced a setback when he spun in the twelfth caution after #16-Biffle spun #12-Newman into him while he was running in third place. Still, in classic style, he managed to find his way back up to the top 5 in the closing stages. Led 135 laps. 6) #88-Dale Earnhardt, Jr. Was very strong all day long, fighting with teammates #48-Johnson and #24-J. Gordon in the early-to-mid stages, but started to fade in the closing laps. Led a race-high 146 laps. 7) #5-Casey Mears After a miserable start to the season, he came into this race with a fast car and high hopes, neither of which were dashed by the bad luck plaguing him in 2008. Even when he suffered some fender rub under the twelfth caution of the race, he climbed back up through the pack. 8) #26-Jamie McMurray Motivated to fight his way back into the top 35, he accomplished this with interest by remaining in the top 5 for the first half of the race and the top 10 in the second, handily taking the top 35 spot from the trouble-plagued #44-Reutimann team with nary a mark on his car. 9) #99-Carl Edwards Proudly declared that “this is the most fun I’ve ever had at Martinsville” after 100 laps and, indeed, was among the leaders for much of the day. A gamble on fuel, however, was about a quarter-lap too short, dropping him three spots to ninth when he ran out of gas in turn four. 11) #6-David Ragan Ran in the top 10 for most of the day and only fell to 11th in the final stages of the race, managing to avoid the carnage of the race. 14) #01-Regan Smith (R) The highest-finishing rookie of the race for the series-tying third time of the season (with #77-Hornish, Jr.) and the second week in a row. 15) #19-Elliott Sadler Despite a very painful back injury after he slipped two discs in his back in an off-track incident earlier in the week, did not give standby driver Dennis Setzer the wheel and ran the entire race. Was involved in #49-Schrader’s spin that brought out the ninth caution. 16) #15-Paul Menard Was pinched into the backstretch wall by a spinning #44-Reutimann under the sixth caution of the race and ran as high as third when he stayed out with #44-Reutimann and #22-Blaney, but slipped back after that. 17) #9-Kasey Kahne Made his 150th Cup start a quiet one. 18) #28-Travis Kvapil Was hit by #84-Skinner on pit road around the time of the fifth caution of the race and was the car off which #10-Carpentier spun to bring out the eleventh caution. 19) #12-Ryan Newman Was spun by #16-Biffle into #48-Johnson to bring out the twelfth caution of the race. 20) #16-Greg Biffle Lacking good track position due to an engine change after qualifying sending him to the back, he gambled early on in the pits by taking two tires following the sixth caution. He slipped back from the top 5 after the gamble caught up to him. Brought out the twelfth caution of the race by spinning #12-Newman into the third-place car of #48-Johnson. 21) #1-Martin Truex, Jr. Sustained some slight damage in the third caution of the race when the field accordioned behind the spinning #43-Labonte. 22) #40-Dario Franchitti (R) Squeezed his way into the field when he tied #45-Petty in speed, but made the race due to owner points. 24) #38-David Gilliland Was the subject of #17-Kenseth’s ire when #17-Kenseth spun off his nose in turn one to bring out the fourteenth caution of the race. He was himself spun by #17-Kenseth a few laps after the restart and hit the wall as a result, bringing out the fifteenth caution. 25) #43-Bobby Labonte After gaining track position through pit strategy, he spun out of second place off the nose of #8-Almirola in front of the entire pack to bring out the third caution of the race. Led 3 laps. 26) #00-Michael McDowell (R) Despite a largely quiet Cup debut, save for a cut right-front tire in the closing laps that black-flagged him just after he lost a lap, he raised the ire of #31-Burton, who believed he wasn’t giving the #31 enough room to race in the final laps. 27) #96-J.J. Yeley Backed into the wall in the fifth caution of the race after contact from #77-Hornish, Jr.
28) #77-Sam Hornish, Jr. (R) Spun #96-Yeley into the wall and spun himself to bring out the fifth caution of the race, then spun once more in turn two just after halfway to bring out the tenth caution. 29) #10-Patrick Carpentier (R) Spun himself off the nose of #28-Kvapil to bring out the tenth caution of the race, stacking the field up behind him as a result. He spun again in the eleventh caution of the race, this time off the nose of #7-R. Gordon. Was in the garage area around the same time as #66-Riggs after the fifteenth caution. 30) #17-Matt Kenseth Lost a lap under the second caution of the race when he was penalized for pitting outside the box after making contact with #31-Burton on pit road. Mired in traffic, he spun in the chain-reaction following the eleventh caution when #10-Carpentier spun. He also bumped #7-R. Gordon during the thirteenth caution while checking up for the spinning #55-Waltrip. Sustained damage to his nose to the point that his splitter had to be removed in the fourteenth caution when he spun off the nose of #38-Gilliland in turn one, then responded angrily by spinning #38-Gilliland soon after the restart to bring out the fifteenth caution of the race. He was penalized two laps for aggressive driving as a result. 31) #84-Mike Skinner Spun with #7-R. Gordon in turn three to bring out the second caution of the race, then sustained damage to the nose of his car during the fifth caution and collided with #28-Kvapil on pit road. 33) #2-Kurt Busch Brought out the first caution of the race when he spun brother #18-Ky. Busch off turn four. He also bumped #55-Waltrip out of the way in turn three, but #55 saved it from spinning. Went behind the wall around the same time as the eleventh caution for #10-Carpentier and returned only to spin with #41-Sorenson in the chain reaction to the twelfth caution when #16-Biffle spun #12-Newman into #48-Johnson. 34) #21-Bill Elliott Sustained damage to the front of his car during the fourth caution, perhaps as a chain-reaction when #41-Sorenson spun. Brought out the eighth caution when he spun down the backstretch. 35) #55-Michael Waltrip Was bumped out of the way by #2-Ku. Busch early in the race, but saved his car from spinning. Crunched his own right-front fender on the restart following the seventh caution of the race (for debris) after contact with #8-Almirola on the restart put #8-Almirola into the wall. #8-Almirola responded in the thirteenth caution by spinning him and getting him stuck on the curb. 36) #41-Reed Sorenson Caused the fourth caution of the race when he spun in turn four, then caused the sixteenth when his transmission failed, stopping him at the entrance to pit road. 37) #49-Ken Schrader Had an excellent qualifying run in his first race in a Toyota, but spun off the nose of #19-Sadler in turn four to bring out the ninth caution of the race. A burnt gear caused him to blow up and cause the sixteenth and final caution of the race, sending him to the garage area. 38) #18-Kyle Busch His first bad day of the season began when his brother #2-Ku. Busch spun him off turn four to bring out the first caution of the race. It got worse when he complained about his cooling system blowing hot air into his helmet, his brake pedal was stiff but provided little braking, he accidentally ran down the empty backstretch pits when he tried to make it 3-wide off pit road, then went behind the wall on lap 283 for a broken rear gear. He returned to the track several laps down, but lost the point lead to #31-Burton. 39) #44-David Reutimann Had a forgettable race in his first start taking over Jarrett’s UPS machine, involved in the race’s sixth caution when he spun on the backstretch and backed up into #15-Menard, pinching him into the wall and slightly damaging #8-Almirola. Still managed to lead a lap in his mangled machine after the fifteenth caution as he, #22-Blaney, and #15-Menard had short-pitted, but then quickly lost the lead to a surging #24-J. Gordon. In the closing stages, he dropped so much rear-end grease on the track that people outside the track could smell it, but no caution was thrown. His car was only identified as the perpetrator when he went behind the wall, his car pouring smoke in the infield. Led 3 laps. 40) #7-Robby Gordon Spun with #84-Skinner in turn three to bring out the second caution of the race and proceeded to harass the leaders trying to get his lap back until he received the Lucky Dog under the eighth caution of the day. He then spun #10-Carpentier in the race’s eleventh caution. Went behind the wall around the time of the fifteenth caution for a broken gear. 41) #66-Scott Riggs Sustained the heaviest damage in the chain-reaction during the third caution to both the front and rear of his car when he was squeezed between #1-Truex, Jr. and #24-J. Gordon. Was behind the wall by the fifteenth caution for mechanical troubles. 42) #8-Aric Almirola After an excellent qualifying run, brought out the third caution of the race when he spun #43-Labonte out of second in front of the field, causing the chain-reaction which collected #66-Riggs, #24-J. Gordon, and #1-Truex, Jr. He was also involved in the sixth caution when the spinning #44-Reutimann pinched #15-Menard into the backstretch wall. He remained on the lead lap, but the engine on his battered Chevrolet blew up around the same time that #22-Blaney went behind the wall. 43) #22-Dave Blaney Ran up near the front in the late stages when he short-pitted with #44-Reutimann and #15-Menard before the fifteenth caution. It didn’t last long, for his ignition failed suddenly, holding up the field, and wound up in the garage area. Led 4 laps.